Mr. Sidney Morgan of Winfield, WV started the museum in 1905. 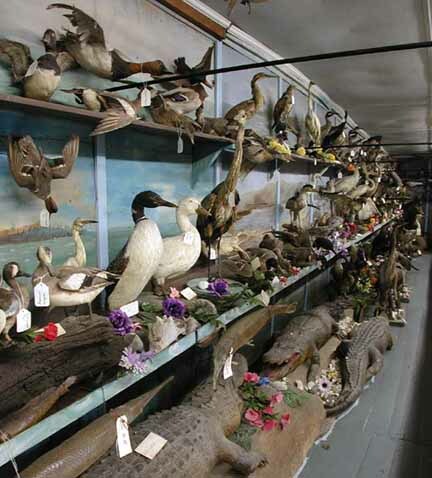 The first bird he mounted was a loon, and it is still housed in the museum. It is in the north end of the building, mounted on a green slab. Everything in the Morgan Museum is very old. The work in the museum covers an extensive period of time. The first bird was mounted in 1905, and the others were added as time went on. The information we got from some of Mr. Morgan's relatives was that Mr. Sidney Morgan was to go with Teddy Roosevelt (as his taxidermist) on a safari to Africa. For some reason or other (which has been lost to posterity), he did not get to go, and, of course, he was very disappointed. While talking to his brother, Mr. Morgan decided that they should go on their own safari, so they built a small sternwheel paddleboat called the Shirley. During Mr. Morgan's lifetime he made five trips all the way to the Gulf of Mexico, collecting birds and animals along the rivers. He also made trips up and down several other rivers, including the Arkansas and the Missouri. He financed his trips by taking along sportsmen from the Charleston area who paid him for the trip. Mr. Morgan was an artist when it came to mounting animals and birds. He made every effort to pose his animals and birds naturally. A good example of his creativity in taxidermy is the red fox located on the top shelf display at the museum. This fox had apparently killed a grouse; so Mr. Morgan not only mounted the grouse, but he also put feathers in the mouth of the fox to make it appear more realistic. Just over from this display is another fox that had killed a duck. This fox is mounted as if running away with the duck slung over its back. As the story goes, Mr. Morgan killed the fox as it was running away from a pond. He then copied its natural pose. You will see many other examples of his creativity as you look around the museum. For example, there is a raccoon that is mounted on an old hollow tree. Mr. Morgan's step-grandson was with him the night that the raccoon was killed. The tree was cut down, and the slab was added to the exhibit. The big elk in the back was the last elk killed in West Virginia. Mr. Morgan killed it at Minnehaha Springs, Pocahontas County and mounted it in 1912. The biggest bird in the museum is the Golden Eagle and the smallest is the little hummingbird. There is also a two-headed calf, which was born in 1926 on one of the farms near Mr. Morgan's museum. It lived for a number of weeks. But, as the story goes, it got out of the barn one cold winter night and froze to death. The farmer found it the next morning just outside the barn. He then gave it to Mr. Morgan to be mounted. There is also a display of some unusual steel traps. The large trap is hand-made. The other is a Newcome trap, which is said to be one of the largest bear traps ever made. The box traps that are on display were used to trap live game, such as rabbits, opossums, etc. Years ago, most boys had a box trap or two. They would use them to catch rabbits for food. Mr. John E. Greene and his associates of Milton, WV donated the Morgan Museum to the Farm Museum. The Mason County Commission paid the sum of nine thousand dollars to move the four buildings to the Farm Museum complex. Volunteers helped with the moving and were responsible for putting the porches back onto the buildings and for leveling them on their foundations. The Museum was started in 1905 just above Winfield on land that is now occupied by the John Amos Power Plant. Mr. Morgan's father owned approximately 1500 acres of choice bottom land where the John Amos Plant is now located. When Morgan's father died, the land was left to Sidney and to his mother, Mrs. Morgan. Sidney Morgan had no interest in farming. His main interests were hunting and taxidermy. Whenever Mrs. Morgan or Sid needed money, they would sell off some of their 1500-acre farm. When the John Amos Power Plant moved in (in 1963) and took over quite a few acres in that area, Mr. Morgan only had four acres left of the original 1500. The power plant took over the land on which the museum was situated, and the museum was sold at auction. Mr. John E. Greene of Milton, WV bought the Morgan Museum and moved it to Milton near the Blinko Glass Plant. He added three other buildings to the complex, a Country Store, a Country Kitchen and a Blacksmith Shop. After operating these for two or three years as a tourist attraction, Mr. Greene decided to give the four buildings to the Farm Museum. The propeller on display is from the Airship Shenandoah. The Shenandoah crashed near Ava, Ohio, in 1925, taking the lives of 14 members of its crew.